"Cutting the Cord" is a buzzphrase these days. 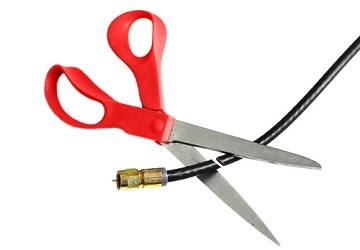 We’re not talking umbilical cords (I’ve cut a couple of those); and the act of cutting the cord actually doesn’t involve bisecting a coaxial cable with a sharp blade like so many stock photos will have you believe. We’re talking about canceling paid television services, like cable, dish, or fiber. Many of you have cut the cord and lived to tell the tale. The Happy Philospher: Kill Your Television! Ditching the ever-increasing cost of television programming is one of the first tenets of frugality. Not to mention that a reduction in mindless television watching should lead to a healthier lifestyle in general. It’s also quite possible to cut the cord and still have plenty of screen time. The alternatives to the $100 a month cable bill include dozens of services that provide some programming at a fraction of the cost. A list and comparison is beyond the scope of this blog, but the links above can get you started. I do use Amazon Prime, which gives me access to thousands of shows, movies, and more music than you could hear in a lifetime. Some seven years ago, we ditched the typical landline phone line. Cut that cord right in two. Being a physician on call about 10 to 12 nights a month, I didn’t want to be without a backup to the cell phone, and we don’t love giving out our cell phone numbers for everything, so we kept our home number. We picked up an Ooma box, ported the number, and have kept that number to this day, despite moving to a new state twice in the interim. Cutting that first cord has saved us $30 a month for about 84 months now. Plugging in the 11 percent annualized that the S&P 500 has gained in that timeframe into my handy, dandy Compound Interest Calculator tells me that I should have an extra $3,800 in my pocket now from that move alone. I’ve even cut the television cord. About three years ago, we decided to live sans paid television. It actually went alright. We didn’t miss it much. It wasn’t football season. But, in order to make our one-time dream home amenable to rental guests, we had to provide premium television. Once again, we were beholden to the dreaded two-year Dish contract. To be perfectly honest, I wasn’t 100% committed to cutting ties completely when I dialed those digits. I don’t live in an area with decent over-the-air reception for the networks, which makes football viewing more challenging without paid television. I thought I might try a free month of Sling TV. At least you can get ESPN channels on that, and at least a dozen other decent channels. Most of my friends have $100+ per month TV packages. So do my parents, who live about a half an hour away. If I don’t have TV, maybe the ball games will be more of a social event with friends and family. Who wouldn’t want me on their sofa, eating Cheetos and pizza and spilling beer, trying and failing to control my temper as I try with all my might to restrain myself from throwing the remote through their television and into the drywall behind it? I wasn’t sure what the best solution might be, but I grew tired of paying $100 a month for something I use a couple times a week a few months of the year. So I made the call. As football season winds down, I’ve had a way to watch the games while paying a much more reasonable rate. I lost the B1G Ten network, but I went to a number of those games in person, and watcged some others with friends or family with my Cheeto-powdered hands, spilled beer and all. I hope you’ll forgive me, or at least not ostracize me. Ultimately, my cord cutting attempt, much like any attempt I’ve made to withhold my rage at the interim head coach for terrible clock management, or the defense’s unfathomable inability to recover a forced fumble, has failed. But I did cut the Dish bill by over 60 percent, which will save me over $600 in the next ten months. It’s not a $1,000 savings, but it’s a start. I realize that saving $600 or $1,200 a year isn’t going to make our break our budget. I’ve been paying these bills all along and managed to become financially independent in spite of them. But if I were to take that approach with every money leak around the house, the slow leaks could build up to a steady stream. And this is a time where we’re doing our best to nail down what our annual spending is and will be going forward.